If your goals include XC race podiums or Strava uphill KoMs, the Lake MX332 could be a worthwhile (albeit significant) investment. New for 2017, the MX332 is Lake’s no-holds-barred cross-country race shoe. 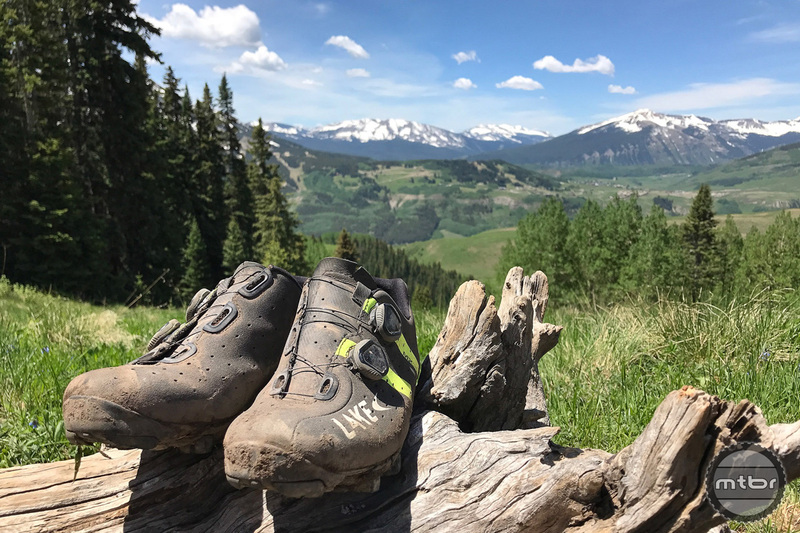 It features Lake’s MX Race last that has a slightly narrower toebox and tighter heel than their Competition last, and less overall volume than the Sport last. Thus, it’s designed for a slimmer fit and most suitable for racing. A broad size range includes men’s regular, wide EE, and extra wide EEE in 39-48 and 50 in full sizes, and half sizes from 39.5-46.5. There are also women’s sizes from 36-43 and half sizes from 37.5-42.5. Closure is handled by a pair of side-mounted L6 BOA push-pull dials. Top line features include an ultra-stiff carbon fiber sole and highly-durable upper that’s constructed from abrasion resistant Helcor leather. Closure is achieved via a pair of side-mounted L6 BOA push-pull dials. The stock color is black/silver, but you can color customize the BOA dials, the tongue, and/or side stripes (as was done on this test pair), or opt for a full custom color upper in less robust kangaroo leather. Lake utilizes a double sole system where the inner sole is a semi-flexible fiberglass platform that allows some flexibility at the ball of the foot. Few riding locales are tougher on mountain bike equipment than Sedona, Arizona. 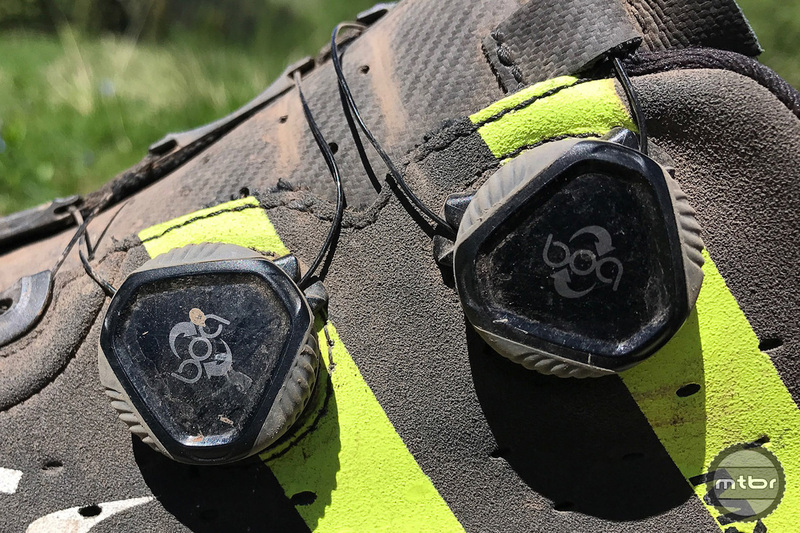 The area’s labyrinth of techy trails are littered with sharp sandstone rock that can both impale and severely abrade body, bike — and shoes. If your gear can survive there it can likely survive anywhere. I mention this because our test time in Lake’s MX332 XC race shoe started here during the annual Magura and friends press camp. Customization options include color striping on the side of the upper. Out of the box our standard width size 43.5 pair of MX332s weighed 394 grams sans cleats. For comparison sake, we weighed a few other similar shoes kicking around the garage including the same size Shimano S-Phyre (361 grams), Specialized Recons (388 grams), Sidi MTB Dragon 4 (394 grams), and Pearl Izumi’s first generation X-Projects (422 grams). Initial fit of the Lake MX322 was good but not great. The included insoles are a bit flimsy and offer only minimal arch support. My arches are on the high side, so I swapped in a set of semi-custom SQlab 215 Insoles ($40) with medium arch support, which bumped per shoe weight up 18 grams. I also experienced a fair bit of heel lift. 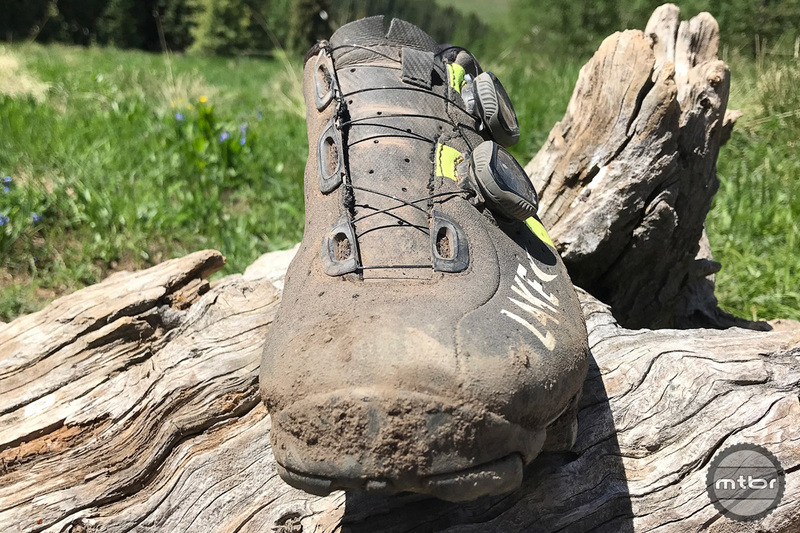 Unlike some other shoes we’ve tested lately, the MX332s don’t incorporate any type of cat’s tongue material or silicone dots behind the heel, which we’ve found to be effective at limiting slip. Instead the MX332’s heel cup is heat moldable. Simply place each shoe in the oven for 4 minutes at 200 degrees, then use your fingers to mold the shoe around your heel. This offered a reasonable improvement in retention — and you can mold them multiple times to truly dial in fit. The heel cup is heat moldable, availing a more customized fit and better heel retention. Closure is handled by a pair of side-mounted L6 BOA push-pull dials. These work well enough, but lack the two-way adjustability of the increasingly common two-way IP1 BOA dials, which allow you to make micro on-the-fly adjustments without fully releasing the dial. I prefer the later, though they are a little taller and thus more vulnerable to rock strikes. The stock black with silver colorway. The underside of the MX332’s is all about efficient power transfer. The carbon fiber sole is among the stiffest we’ve tested, meaning watts in equals speed out. 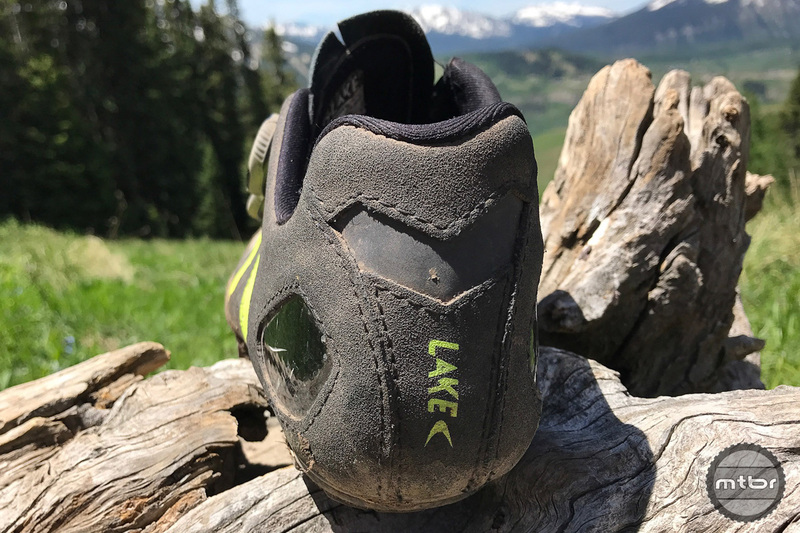 Lake attempted to maintain a modicum of comfort utilizing what it calls a double sole system where the inner sole is a semi-flexible fiberglass platform that allows some flexibility at the ball of the foot. This is “suspended” over the outer rigid carbon sole. It seems like a good idea in theory, but despite the grippy, real rubber tread, if you spend a lot of time off the bike this is not the shoe for you. These are thoroughbred racers through and through. A toe guard offers extra protection for the shoe and you. 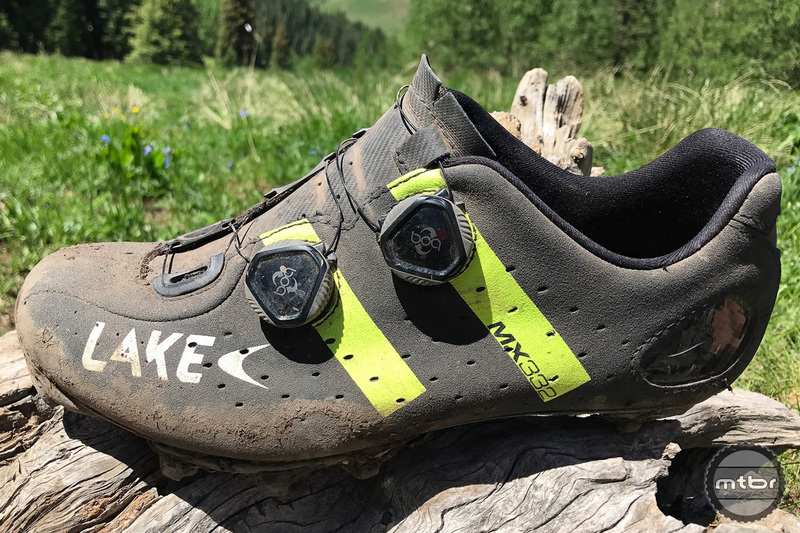 Bottom line, if your goals include XC race podiums or Strava uphill KoMs, the Lake MX332 could be a worthwhile (albeit significant) investment. 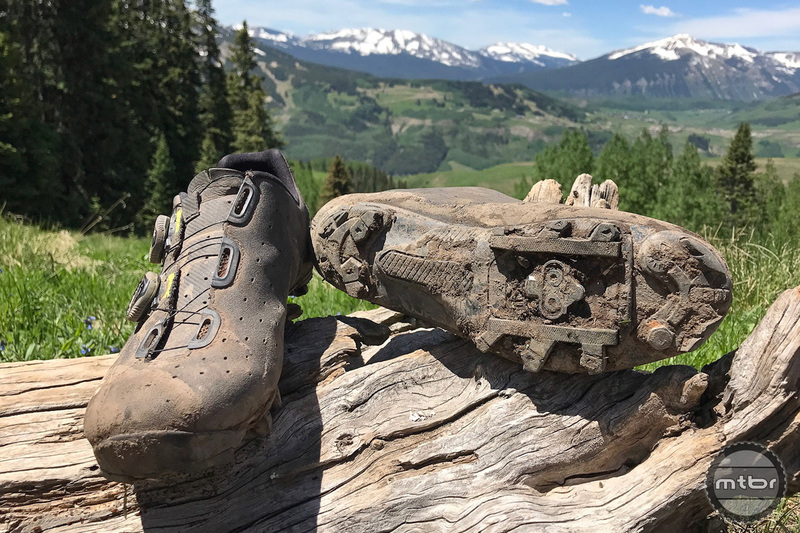 The Helcor leather is among the most robust and durable upper materials we’ve encountered in a mountain bike shoe. The soles are exceptionally stiff. And after a little fiddling, we were able to dial in a comfortable and reasonably secure fit. 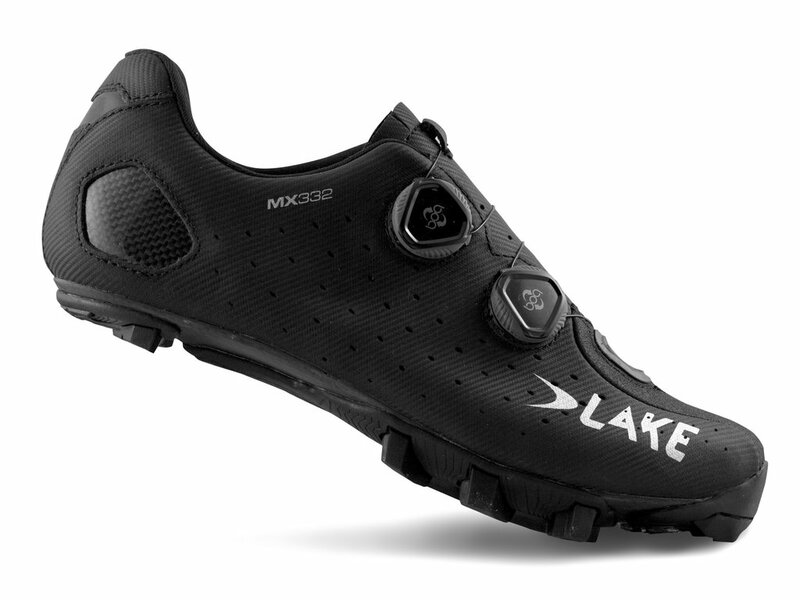 It is highly understated the HUGENESS of Lake (already wide) making an EXTRA WIDE shoe. Fifteen years of sizing up in cycling shoes to get decent width may well be over with these shoes! Hooray!